See the video below for a video demonstration of one of the exercises. This is just the latest of a number of activities brought outdoors in the sun-soaked landscape so I’ve now added a new tag “Al Fresco” for things conventionally done indoors that resorts have taken outdoors. People question why you would want to sit in a gym when you have travelled thousands of miles to be in a natural paradise. 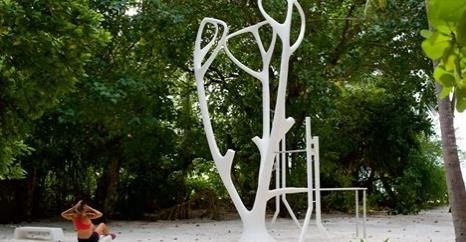 I was one of those guys who would do workouts on my Maldives holidays. I wanted to keep momentum in my training, I could get great sessions in because I was eating and sleeping extra well, and the general enthusiasm of the whole holiday gave me an extra boost. I did appreciate when resorts made an effort to bring the outdoors in with big picture windows and well situated views. 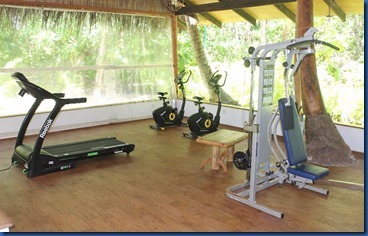 But AaaVeee’s fitness center goes a step even further. Bringing the inside…out. Their gym is fully outdoors. It does have clear wind/rain sheets to lower during inclement weather. It is so outdoors, that it even has a palm tree going in the middle of it through the floor. 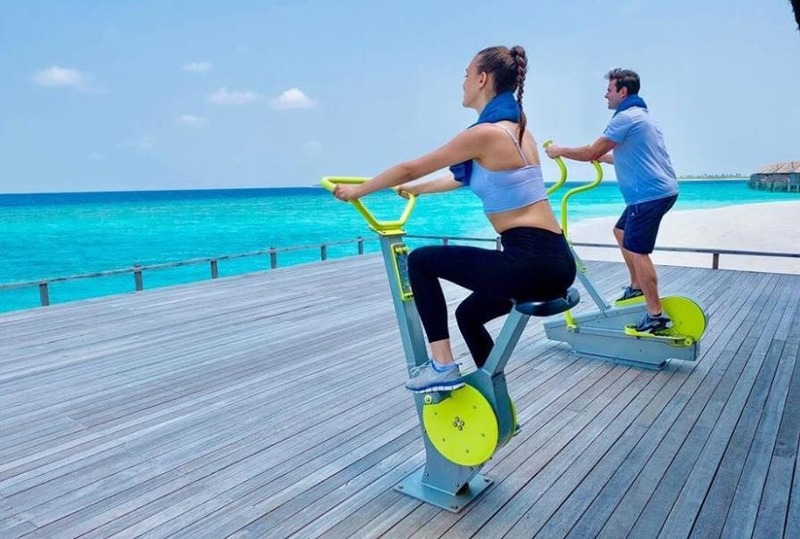 If you prefer the solidity of a stationary bike (and other perks like safety), but want to get outdoors to enjoy the vistas of paradise, JA Manafaru has added to its already extensive estate of al fresco fitness with outdoor workout machines. I’ve long applauded resorts who gave their gyms prominent positions with open windows so that a holiday workout could also be as enjoyable as the rest of the vacation (too many were after-thought facilities sequestered in claustrophobic rooms in the middle of the island). You don’t get much more expansive workout views to distract you from your toil than Manafaru’s fitness deck. At most resorts, the staff give at bit of themselves every day to make the visit by the guests memorable and distinctive. 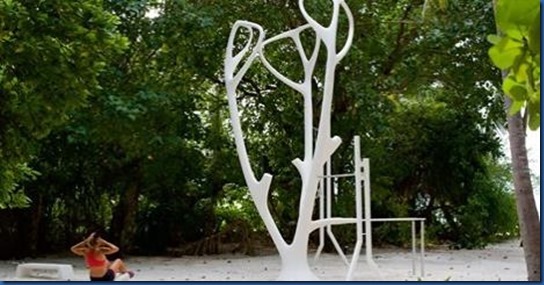 At Amilla Fushi, this investment is expressed indelibly in a unique exhibition of creativity and personality. 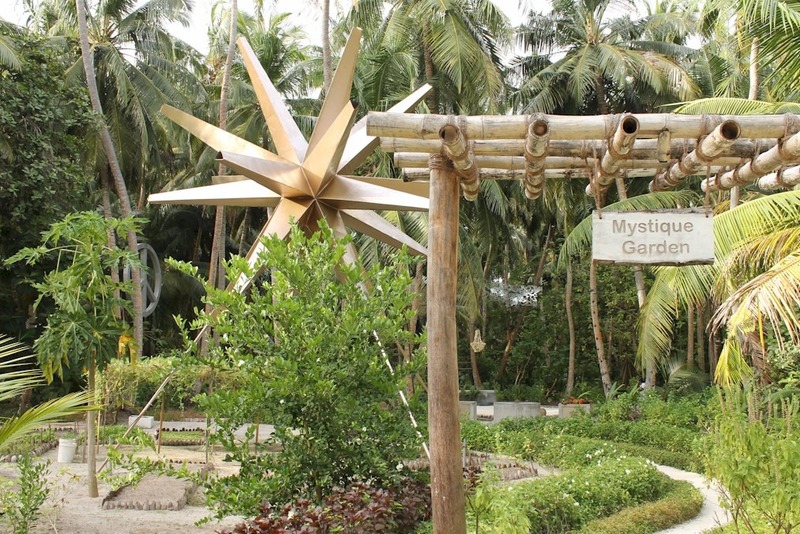 The Mystique Garden is a chef’s garden where you can enjoy special meals prepared and served for you al fresco. 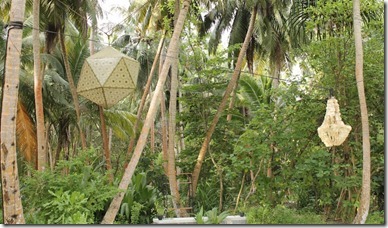 But your nook is more than the lush greenery of an equatorial paradise. 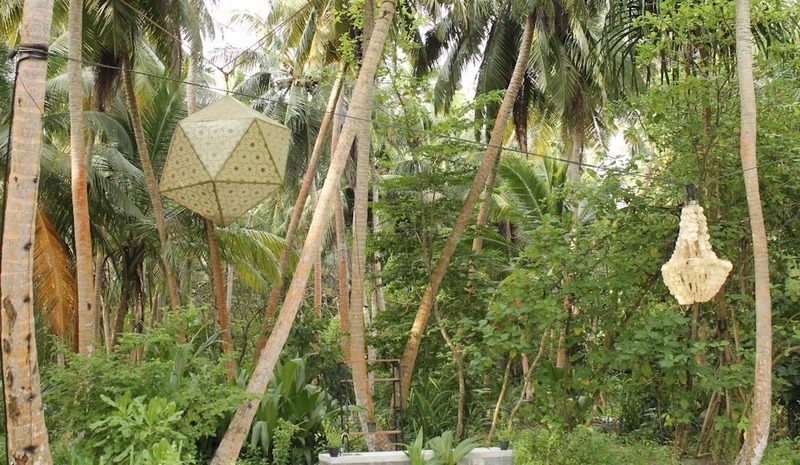 It accented by a collection of striking art works suspended in the tropical canopy. These pieces are the works and gifts of the resort staff themselves. 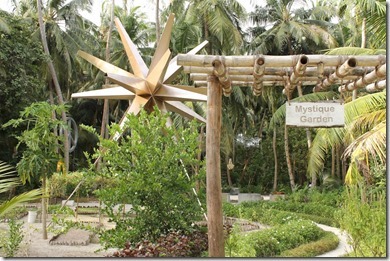 I’ve been to lots of chef gardens in the Maldives (in fact, with this post, I am adding a new tag for them “Chef Garden”, but Amilla’s is a bit extra-magical, surrounded not just by the natural beauty of the location, but also by these inspired pieces which offer a personal welcome from the hearts, minds and souls of the resort team to their guests. 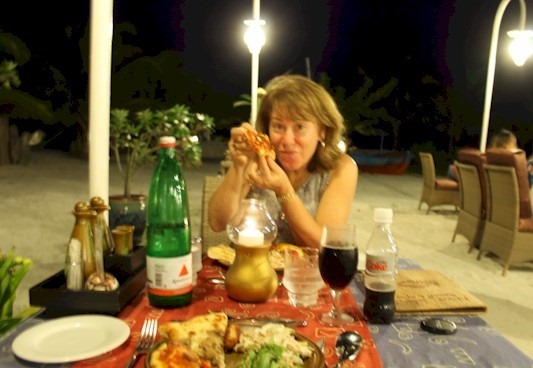 I do love al fresco dining…sitting out in the open breathing in the sea-kissed night air. The soft fabrics of the surrounding canopy and the cushions adds an even more softness to the atmosphere surrounding you, the palm fronds swaying above you and the power fine sand underneath you..
Not every al fresco meal has to be toes-in-sand table to provide a charming moon lit meal. 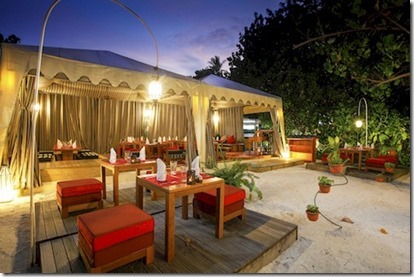 One and Only Reethi Rah’s Tapasake restaurant is one of the best outdoor restaurants we have seen. 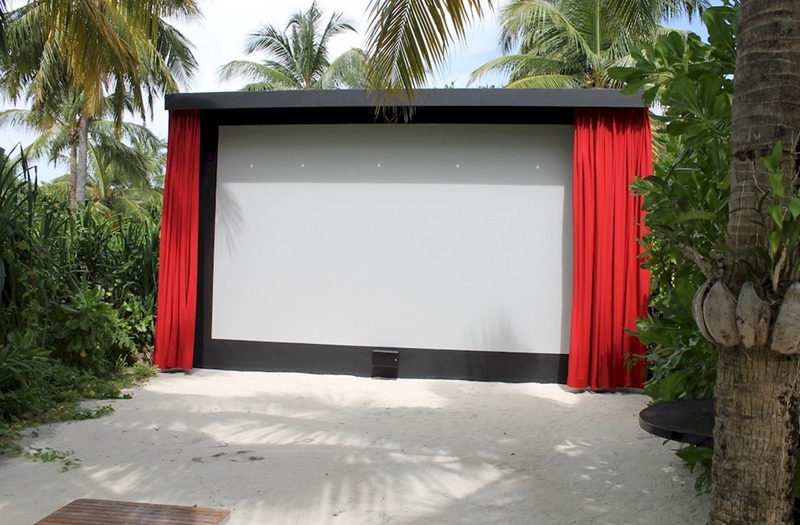 Most resorts have an outdoor ‘feel’ being situated in areas open on all four sides, but full out-in-the-open rather than just open-air is much rarer (for the sensible reason that you do get no protection from the occasional precipitation and strong breeze limiting it usage during those times). There is little that beats the literal atmosphere of dining outside in the perfect temperature surrounded by a chorus of nature’s sounds under a canopy of stars. 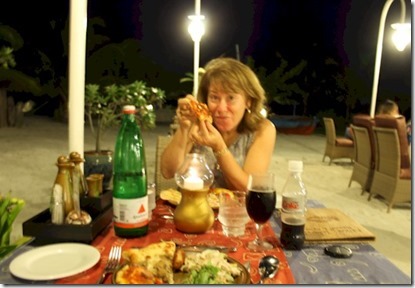 When we first started coming to the Maldives, the notion of dining on the beach was relatively novel. 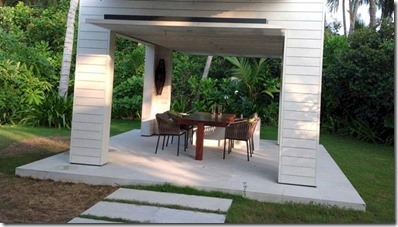 Most of the resorts had designated sheltered dining areas. We would typically ask the waiter if we could move our table out to the water’s edge and in most cases they were more than happy to do so. 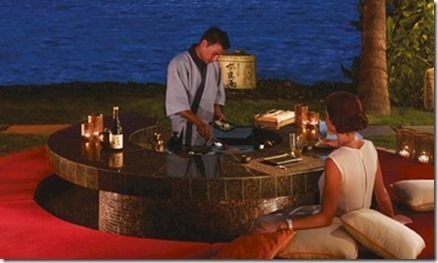 Now, beach dining is featured prevalently both as a special supplement experience and as regular dining areas. Nika has given al fresco dining a fresh setting inspired by the island’s Italianate heritage and character. 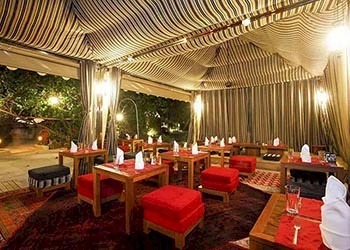 It has situated its main dining area (with a backup inside area for unfavourable weather) in an area that resembles some Mediterranean avenue. It features wrought-iron lamp posts which evokes a sandy Cinque Terra boulevard with people dining on gamberti and chianti late into the evening. And the beach equivalent of your own private open shelter al fresco dining is Cheval Blanc Randheli’s outdoor pavilion.